Abram A. Unruh was born October 20, 1903 in Barvenkovo, South Russia to Abram H. and Katharina Toews Unruh. From very early on Abram had fostered a dream of missionary service in India. While still in the Ukraine he had even considered walking from Russia to India via Afghanistan and the Hindu Kush mountains. In Simferopol, Crimea, Russia, Abram attended high school and polytechnical school. In 1920 Abram was baptized at Crimea, South Russia. It was in 1924 that his family immigrated to Winkler, Manitoba and he became a member of the Mennonite Brethren Church of Winkler. During this time Abram met and married Anna J. Enns (1900-1972) on October 21, 1926. Abram continued to attend school and in 1928 Abram graduated from the Winkler Bible School. Both Abram and Annie shared a vision for mission. Despite their eagerness, they could not leave for more than nine years because of the economic depression in Canada. Abram taught at Dalmeny, SK, Bible School for four years and Winkler Bible School for one year before being ordained in 1935 by Rev. H.W. Lohrenz and Rev. H.S. Voth in the Mennonite Brethren Church at Winkler. He was appointed as a missionary to India. In 1936 the Unruhs finally took their first of several assignments which would keep them in India until 1967. In India Abram served mainly in Gadwal and Wanaparty with shorter terms at Nagarkurnool and Shamshabad. The Unruhs made an important contribution to the growing self-identity of the Indian MB Church, training its leadership and the establishment of elders institutes. In 1972 Annie died. Three years later, Unruh married Agatha Friesen, nee Klassen, who also predeceased him on August 31, 1983. Abram Unruh died on September 7, 1988 in Winnipeg. Together Abram and Annie had five children: Peggy, Kathryn, Helen, Louise and Donald. The tapes were donated by Walter and Peggy Regehr (daughter) in 1981. Some of Unruh's rare books and personal papers came from Peter Hamm in 1985. Abram A. Unruh donated his original papers and the letters from his father, A.A. Unruh, in April, 1986. Another donation was made in 2003 by A.A. Unruh’s son Don Unruh. A.A. Unruh also donated some letters from A.H. Unruh pertaining to the Board of Reference and Counsel of the Canadian Conference of MB Churches. The letters are now located with the Reference and Counsel collection. In 2010, George and Louise (Unruh) Block, from Saskatoon, SK, donated an article to CMBS. The Abram A. Unruh fonds consists of 10 series Correspondence and articles; Biographies; Messages, sermons and outlines; Statements and Reports; Booklets; The Unruh Family history; Family Correspondence; Mennonite History and the Mennonite Brethren Church in Canada; Personal Notes and Correspondence; Books collected by A.A. Unruh. This fonds documents well the transition that Mennonite Brethren missionaries faced when policies changed from leading dependent mission churches to fostering indigenous churches. Reports, minutes, and correspondence show the changes that missionaries faced and their responses to those changes. The CMBS tape collection holds two tapes of A.A. Unruh speaking to the family upon the 50th anniversary of their coming to Canada (1975). The photographs are of missionaries from the Mennonite Brethren Church in Russia. The CMBS video collection holds a 16 mm film of Abraham A. Unruh's silent documentary of him, his family and their work in India. The film documents the Indian culture that the Unruh’s were working in. Worship service, funeral procession, Indian market, parade and farming practises are shown. It is approximately 30 min. Note: this film has been digitized into DVD format. Accession numbers: 1982-60, 1986-17, 1985-19, 2003-048 and 2010-017. Finding aid consists of a series description and a file list. Finding aid for tapes: NA-15-051 and NA-15-053. Finding aid for photographs: NP27-1. Finding aid for film: NMF-25. Finding aid for DVD: MDV-14-1. See also A.A. Unruh fonds file list 107a. See also NP28-1 and NP28-2, a photograph collection of mission work in India. NP28-1-16 is a family picture of the A.A. Unruhs taken in Gadwal, India. Description updated by Tamara Dyck, May, 2008 and again in October, 2010. Some restrictions on access apply. I. Correspondence and articles. – 1943-1978. – 4 cm. This series consists of correspondence with H.H. Janzen, Bob Friesen and David Duerksen. It also contains periodical clippings or articles by various people in the mission field. They are not arranged in any particular order. Finding aid: Vol. 1079, No. 1-9. II. Biographies. – 1945-1981. – 4 cm. This series consists of miscellaneous articles and biographies of John A. Harder, B.B. Janz, and other conference and institutional persons. Finding aid: Vol. 1079, No. 10-12. III. Messages, sermons and outlines. – 1944-1981. – 46 cm. This series consists of messages, sermons and outlines created by A.A. Unruh during his time in India. Finding aid: Vol. 1079, No. 13-42; Vol. 1253, No. 1-19. IV. Statements and Reports. – 1908-1975. – 80 cm. This series consists of papers, statements, correspondence, minutes and reports by A.A. Unruh and others about missions and evangelism in India. Finding aid: Vol. 1080, No. 43-73; Vol. 1081, No. 76-107; Vol. 1082, No. 109-117; Vol. 1252, No. 36-56. V. Booklets. – 1903-1965. – 8 cm. This series consists of booklets on various topics, prepared by A.A. Unruh and others. Finding aid: Vol. 1081, No. 73a-75. VI. The Unruh Family History. – 1824-[ca. 1957]. – 2 cm. 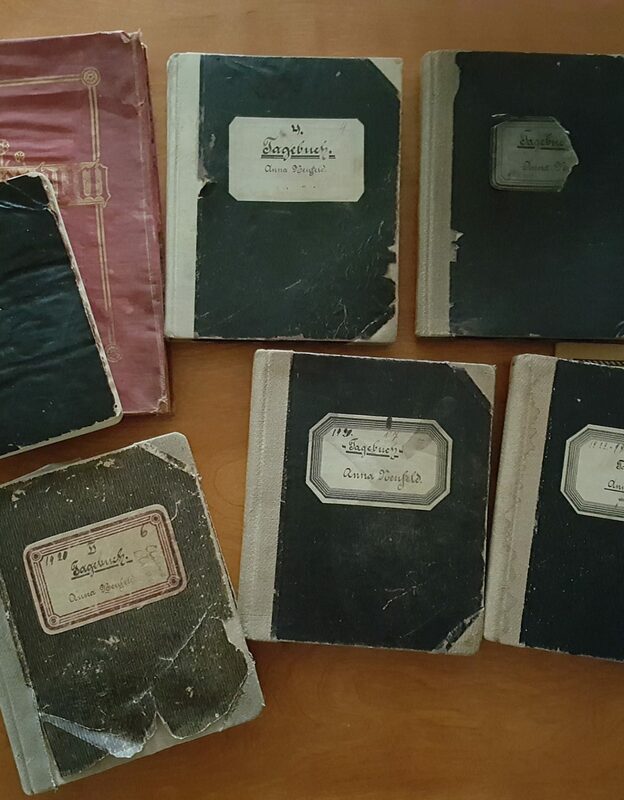 This series consists of a Christmas card in the form of a booklet, church records from Russia to America and family records of births and deaths. Finding aid: Vol. 1082, No. 107-108. VI. Family Correspondence. – [ca. 1968-1975]. – 4 cm. This series consists of letters written by A.A. Unruh to his family and received from his family. Finding aid: Vol. 1082, No. 118-120. VIII. Mennonite History and the Mennonite Brethren Church in Canada. – 1900-1985. – 29 cm. This series consists of articles, notes and statements by A.A. Unruh on the various aspects of Mennonite faith. Finding aid: Vol. 1252, No. 1-26. IX. Personal Notes And Correspondence. – 1937-1987. – 4 cm. This series consists of personal and business correspondence. As well it consists of notes and clippings of various people in the mission field and of A.A. Unruh’s father A.H. Unruh. Finding aid: Vol. 1252, No. 27-35. X. Books collected by A.A. Unruh. – 1947-1983. – 4 cm. This series consists of several books on Christianity collected by A.A. Unruh. Finding aid: Vol. 1253, No. 20-28. 1. Correspondence with and articles by H.H. Janzen. -- 1965-67. 2. Periodical clippings about P.R. Lange. -- 1961. 3. Periodical clippings about C.C. Peters. -- 1971-1973. 4. Periodical clippings of articles by Frank C. Peters. -- 1965-1977. 5. Periodical clippings of articles by G.W. Peters. -- 1956, 1965, 1970, 1978. 6. Periodical clippings of articles by K.L. Schellenberg. -- 1943, 1945, 1960. 7. Periodical clippings of articles by Nick Willems. -- 1973. 8. David Duerksen (misc.). -- [19--]. 9. Correspondence with Bob Friesen. -- 1972, 1973. 10. Biography of John A. Harder. -- 1969, 1971. 11. Biography of B.B. Janz. -- 1951, 1964, 1970. 12. Misc. articles & biographies of conference and institutional personalities taken from yearbooks and periodical clippings. -- 1945-1981. 13. Messages on "The Ministry," by A.A. Unruh, typed in English. -- 1961-1966. 14. Messages on the church. -- 1958, [19--]. "The Ministry in the Mennonite Brethren Churches of India." -- [19--]. 15. Isaiah Outlines. -- 1955-1965. 16. Old Testament Outlines. -- 1955-1966. 17. Messages on I and II Peter. -- 1955-1965. 18. Messages on Hebrews. -- 1949-1965. 19. Messages on Titus. -- 1964-1966, [19--]. 20. Messages on James. -- 1966, [19--]. 21. Messages on I and II Timothy. -- 1953-1959. 22. Messages on I and II Thesselonians. -- 1963-1964. 23. Messages on Colossians. -- 1956-1964. 24. Messages on Philippians. -- 1953-1966. 25. Messages on Ephesians. -- 1954-1964. 26. Messages on I and II Corinthians. -- 1956-1965. 27. Outlines on Romans. -- 1954-1966. 28. Outlines on sermons about Christ Jesus. -- 1945-1964. 29. Messages about the Servant of God. -- 1947-1966. 30. Sermons and reports. -- 1963-1981. "Mennonite Brethren Fellowship of India--Confession & Regulations. -- [19--]. Correspondence with Mennonite Brethren Missions/Services. -- 1980. 31. Two papers on the gospel of Paul. -- [19--]. 32. Outlines on I, II, and III John. -- 1946-1966. 33. Outlines on Revelation. -- 1953-1957. 34. Outlines on Galatians. -- 1944-1957. 35. Teaching program in the India M.B. Church. -- 1958. 36. The Coming of Christ. -- 1956-1957. 37. Evangelistic messages. -- 1961-1967. 38. Lessons on Acts. -- 1961-1967. 39. Outlines on Gospel of Mark. -- 1949-1966. 41. Outlines on the Gospel of John. -- 1945-1968. 42. Outlines on Luke. -- 1947-1967. 43. Guiding principles and field policies. -- 1947. 44. Paper: The Power of the Word of God by D.G. Arthur. -- 1963. Resolution of missionary delegates of the field council. -- 1947-1955. 45. Papers about missionary work. Messages. -- 1945-1964. 46. Statement: Offices in the M.B. Church of India. -- [19--]. Report: Elders Training Program Handbook for Ministers. -- 1963. 47. Various statements, regulations and papers on the subject of a national church. -- 1955-1969. 48. Papers on the subject of peace and growth of the national church. -- 1959-1970. 49. Paper on principles for church discipline. -- 1968. 50. A course for a Bible school compiled by A.A. Unruh, "The Church of Jesus Christ." -- [19--]. Questionnaire and regulations used for ministers in India before ordination. -- 1959, [19--]. 51. Constitution, confession, and regulations of the India M.B. Church. -- [19--]. Statements to the governing council in India. -- 1960. 52. Report of A.A. Unruh to brethren and friends of Wanaparthy. -- 1956. Program of instruction for elders of village churches. -- 1957. Various papers and messages on the governance of the church in India. -- 1956-1970. 53. Messages and papers on the church. -- 1957-1967. 54. Report of the Education Committee of the India Governing Council. -- 1959. Constitution and minutes of field and Governing Council meetings of the Conference of the M.B. Church in India. -- 1943-64. 55. Confessions of Faith and minutes of Governing Council. -- 1960-66. 56. Field reports. -- 1962-1970. History of the Winkler Bible School by A.A. Unruh. -- 1975. 57. Resolutions and policies of the General Conference of the Mennonite Brethren Church of North America regarding foreign missions. -- 1943-1962. 57a "Mission Church Relationship," a paper by G.W. Peters. -- 1968. Program for mission evaluation. -- 1974. Memorandum of Association of Mennonite Brethren Property Association of India Private Ltd. -- 1956. 58. Consitution of the Conference of the American Mennonite Brethren Mission in India. -- 1936, 1938, 1940, 1954, 1957, 1959-1966. "The Growth and the Important Place of the Local Church in the Ministry of the Local Church in India," a paper by A.A. Unruh. -- 1972. 59. Statements and reports of evaluation of the M.B. church program in India. -- 1956-1972. 60. Statements by Board of Missions to the General Conference. -- 1965, 1966. Letter to A.A. Unruh from J.H. Epp regarding missions in India. -- 1967. Long range program plans for various mission fields. -- 1965-1966. 61. The New India Plan. -- 1958, 1959. Letter from A.A. Unruh to J.B. Toews regarding the new policies. -- 1958. 62. Report after the visit of J.B. Toews and A.E. Janzen. -- 1961. 63. Letter from J.H. Epp to all field administrative representatives and all missionaries regarding revised mission policies. -- 1967. 64. Conference on faith and life. -- 1966. 65. Conferences of ministers and church leaders. -- 1963-70. 67. Papers on guiding principles for India's M.B. Church. -- 1955-1961. 68. Reports and correspondence regarding the Peace Conference of India Historic Peace Churches. -- 1957-1967. Program for Elders' Institute. -- 1966. 69. Correspondence with Board of Missions and Services. -- 1957-1969. 70. Mission reports, correspondence, minutes, of missionary conferences. -- 1942-1970. 71. Correspondence, minutes, reports regarding missions in India. -- 1950-56. 72. Correspondence, reports, and minutes regarding missions in India. -- 1957-59. Minutes of the first meeting of the M.B. Church Fellowship. -- 1960. 73a "Principles of Evangelism" by A.A. Unruh and R.K. Murphy in Telegu. Two copies. -- 1965. "Church Discipline" in Telegu. Two copies. "Outlines on Christian Education" by Dalavai J. Arthur. -- 1963. "Evangelism" by A.A. Unruh in Telegu. Two copies. -- 1965. "The Ministry in the Mennonite Brethren Churches in India" by A.A. Unruh in Telegu. -- 1964. "The Personality of the Holy Spirit in His Working power" by C. Unruh in Telegu. -- 1922, 1959. "Revival of Spiritual Church Fellowship" by A.A. Unruh in Telegu. -- 1965. "God's Word as Guide in Church Discipline" by A.H. Unruh in Telegu. -- 1959. "Lessons in God's Plan of Salvation" in Telegu. -- 1953. "Statement of Principles of the Mennonite Brethren Church Fellowship which need special attention in the M.B. Church Brotherhood" by A.A. Unruh in Telegu. -- 1964. "Fundamental Doctrines of the Holy Scripture" by H.F. Toews in Telegu. -- 1955. "Revival of Spiritual Church Fellowship" and "Qualifications and Responsibilities for Ministry of the Gospel" messages delivered at the Ministers' Retreat by A.A. Unruh. -- 1963. "Mennonite Brethren Fellowship of India Confession and Regulations." -- [19--]. "Offices in the M.B. Churches in India." -- [19--]. Black binder of sermons by A.A. Unruh. -- 1949-1965. 74. Booklets by J.H. and Mrs. Lohrenz. -- Undated, 1932, 1943. 75. "Definitely Occupying the India Mission Field" by J.H. Pankratz. -- 1903. 76. Copies of letters written by missionary Anna Hanneman to Heinrich Voth (Bingham Lake) -- 1916, 1918. Copy of letter by G.N. Thomsson, missionary. -- 1908. 77. Paper by H.H. Janzen, "Die Entwicklung des Missions Interessent unter den Mennoniten in Russland." -- [19--]. 78. Paper by Arthur J. Braun (missionary), "Die Motiven des Missionaren." -- [19--]. 79. Paper, author not given, "History of M.B. Missions." -- [19--]. 80. Correspondence, minutes, reports of the Liaison Committee. -- 1959-1971. 81. Correspondence and reports with American Mennonite Brethren Mission and Board of Foreign Missions. -- 1926-1949. 82. Correspondence and notes on M.B. John and other native ministers. -- 1956-1973. 83. A paper by A.A. Unruh, "Some Observations Regarding the Gadwal Mission Field." -- 1969. Other reports regarding Gadwal. -- 1953, 1959, 1974. 84. Report by Dr. M.B. Niyagi. -- 1956. 85. Agenda for Field Association Meetings. -- 1957-1963. 86. Questionaires on missions given to U.S. District Conferences and responses. -- 1969. 87. Letters from Abram and Annie Unruh to "liebe Geschwister." -- 1947-1958. Radio messages. -- 1961, 1962. Articles by A.A. Unruh for magazines persons. -- 1963-1968. "Report of my experience at the time of the Police Action, Hyderabad State." -- 1948. 88. "Renewed Evangelistic Outreach by the India Mennonite Brethren Church" by A.A. Unruh. – [19--]. Pictures and maps from the 50th Anniversary booklet of the Telegu Convention. -- 1954. 89. Statistical reports of the Sathyaveda Correspondence School. – 1965, 1974, 1975. 90. Agreement with the American Mennonite Brethren Mission, Wanaparthi, Hyderabad State, regarding changing from mission to self support. – 1955. Questionnaire for Wanaparthi field and responses. – 1955. 91. Minutes of meetings and correspondence regarding furlough. – 1953, 1956, 1966. 92. Reports of the Mennonite Christian Service Fellowship of India. – 1965. 93. Reports of the Plain Truth Correspondence School. – 1965-1968. 94. A Message on church discipline by A.A. Unruh. – 1968. 95. Lists of titles conference messages. – [19--]. 96. Reports of various boards in India. – 1970-1971. Minutes of the Board of Literature at Mahbubnager. – 1964. 97. Regulations written by A.A. Unruh for evangelism and home missions. – 1959, 1965, [19--]. 98. Papers, reports, and recommendations regarding evangelism in India. – 1958-1965. 99. Reports, papers, and policies regarding evangelism in India. – 1964-1969. 100. Policies regarding the national church and missionaries’ reactions to proposed changes. – 1959-1960. Report of Ministers’ Course. -- 1964. Various other reports on missions in India. – 1968-1970. 101. Reports, papers, and statements regarding missions in India. – 1951-1971. 102. Principles and policies of operation by M.B. Church Conference Board of Missions. – 1960. 103. Doctrinal statements of the M.B. Church in Canada. – 1953. 104. Proposals, minutes, reports of the Mennonite Brethren Youth Organization in India. – 1955-1958. 105. Research notes, minutes and reports on Christian education in India. – 1946-1974. 106. Reports, confessions of faith in Indian dialect. – 1921-1965. 107. Minutes of Reference Committee. – 1942-1946. Minutes of Administrative Committee. – 1948-1952. Minutes of the American Mennonite Brethren Missionary Conference. – 1945-1947. 107a. Christmas card from India, probably sent from the Unruhs to friends in North America. The card is in the form of a booklet that contains four photographs of the mission work in Wnaparthy. – [ca. 1957]. 107b. Church membership transfers and certificates from Russia to America. – 1889-1902. 108. Record of family births and deaths of the Unruh family. – 1824-1903. 109. Board of Evangelism papers, reports, minutes. – 1960-1967. 110. Statistics regarding mission work in India. – 1946-1966. 111. Field Council Minutes. – 1946-1955. 112. Missionary Fellowship minutes and reports. – 1964-1966. 113. Minutes of Calcutta Consultations on Evangelism. – 1965-1966. 114. Reports on Evangelism India. – [19--]. Programs for Evangelism Conferences. – [19--]. 115. Reports and minutes of the Shamshabad Bible Seminaries. – 1960-1965. 116. Reports of the General Council meetings at Shamshabad. – April 9-12, 1969. 117. Paper by A.A. Unruh, “Offices in Mennonite Brethren Churches of India.”— [19--]..
118. Copies of letters. RESTRICTED. – 1968-1975. 119. Letters to children. RESTRICTED. – [19--]. 120. Letters. RESTRICTED. – [19--]. 1. Articles and notes on Mennonite History. – [ca. 1961-1977]. 2. Articles and notes on Mennonite History. – [ca. 1946-1977]. 3. The Church of Jesus Christ. – 1957-1970. 4. Church government. – [ca. 1958-1970]. 5. Offices of the local church. – [ca. 1970]. 7. Reports on Evangelism. – 1964-1966. 8. Missions. – [ca. 1950-1965]. 9. Church administration. – [19--]. 11. Ordination. – [ca. 1966]. 12. Statements and reactions on various church related issues. – [ca. 1953-1966]. 13. Church Discipline. – [ca. 1967]. 14. Church Leadership. – 1970. 16. Notes on Evangelism. – [ca. 1967-1969]. 17. Thoughts on a Christian life. – [19--]. 18. Statements on Missions by A.A. Unruh. – 1961-1962. 19. Thoughts on missions. – [19--]. 20. The Call to missions and the organizations of support and leadership. – [19--]. 21. Charter of the American Mennonite Brethren Mission Union, Buhler, Reno County, Kansas. – 1900-1944. 22. Disturbances in the M.B. Church Mission Program since 1957-1970. – [1970?]. 23. Articles about the Winkler Mennonite Brethren Church. – 1963-1974. 24. Manitoba Mennonite Brethren Convention. – 1985. 25. Contribution of the Manitoba Mennonite Brethren Churches to home and foreign missions. – [ca. 1970]. 26. Articles written by A.A. Unruh about the various aspects of Missions. – [19--]. 27. Personal notes and articles about people important in missions. – [ca. 1943-1985]. 28. Article about A.A. Unruh and family returning to missions. – 1955. 29. Correspondence regarding A.A. Unruh’s 3rd mission term. – 1962. 30. Business Correspondence. – 1967-1970. 32. Russian Czar family. – [ca. 1937-1968]. 33. Letters to and from Mennonite Brethren Missions and Services International, and some articles on missionaries. – 1968-1987. 34. Notes, articles and clippings by and about A.H. Unruh. – [ca. 1946-1982]. 35. Archival information regarding A.H. Unruh papers. – [ca. 1970]. 36. India. – [ca. 1955-1975]. 37. “Qualifications and responsibilities for the ministry of the gospel” by A.A. Unruh. – 1963. 38. Mission reports and observations by A.A. Unruh. – [ca. 1961-1970]. 39. Mennonite Brethren Church in India. -- [ca. 1952-1962]. 40. Ministers and church workers conferences, India. – [ca. 1963-1970]. 41. Workshop on Mission Evangelism, India. – 1966. 42. Village Church Elders Institute, India. – 1954-1963. 43. “The Ministry in the Mennonite Brethren Churches of India”, by A.A. Unruh. – 1964. 44. “Offices in the Mennonite Brethren Church of India”, by A.A. Unruh. – 1961. 46. “The Indigenous church in India”, by A.A. Unruh. – 1970. 47. “Der Missionar in der Heidenmission”, verfasser: Arthur J. Brown. – [19-?]. 48. Reports and articles by A.A. Unruh, India. – ca. 1966. 50. Ministerial courses, India. – [ca. 1963-1964]. 51. Programs from services in India. -- [ca. 1950-1969]. 52. Evangelistic Conference in Wanaparthi, Dec. 1965. – 1965. 53. Special prayer meeting for our fields and churches. – 1964. 54. Cooperation between the India Church and the Missionary Conference. – 1944. 55. Confession of faith of the Mennonite Brethren Church, Telagu. – 1921. 56. The Indigenous Church in India. -- 1970. 1. Sermon Outlines from India. – [ca. 1961-1970]. 2. Sermons on the Gospel of Mark. – [19--]. 3. Sermon outlines on Malachi and Zechariah. – [19--]. 4. Sermon notes on Matthew. – [19--]. 5. Sermon notes on the Anti-Christ. – [19--]. 6. Outlines of Revelation. – ca. 1964. 7. Sermon outlines. – [ca. 1954-1965]. 8. Idol worship. – [19--]. 9. Outlines for articles. – ca. 1958-1963. 10. Notes for articles. – [19--]. 11. Sermon outlines written while in Canada. – [19--]. 12. Outlines for Acts, Romans, I Corinthians, II Corinthians, Galatians and Ephesians. – [19--]. 13. Outlines for the Old Testament. – [19--]. 14. The Gospels. – [19--]. 15. Outlines for Philemon, Colossians, I and II Thessalonians, I and II Timothy. – [19--]. 16. Various outlines. – [19--]. 17. Bible verse reflections on missions and missionaries. – [19--]. 18. 6 booklets of sermon notes. – ca. 1963. 19. Two booklets of notes. – [19--]. 20. Israel and Egypt in prophecy, Richard W. De Haan. – [195-?]. 21. The Call for Church Discipline, Paul R. Van Gorder. – 1982. 22. The Holy Spirit : what He does for us, Richard W. De Hann. – 1983. 23. Das Heiligungs-leben des Christen, von A.H. Unruh. – [195-?]. 24. John H. Voth : a missionary evangelist, John H. Lohrenz. – [19--]. 25. Die Praxis der Mennoniten Kirchengemeinden und die Heligie Schrift, J.H. Janzen. – [19--]. 26. God’s word as guide in church discipline, The Ministry in the Mennonite Brethren Churches of India, Principles of Evangelism by A.H. Unruh [all in Telagus]. – 1959-1965. 27. Andhra Christian lyrics [in Telagus]. – 1947.